The Cleveland Public Library has supported Public Art for over 100 years. Art at the Library has inspired, mesmerized, and created much discussion over its purpose and meaning. Art creates dialogue and makes us realize we all see something different so let’s talk about it. Ed Mieczkowski was one of those artists who saw and painted things differently. Back in 1979, the Library partnered with the Cleveland Area Arts Council to select three artists to paint new murals for the walls in Brett Hall. These artists were Robert Jergens, Chris Pekoc and Edwin Mieczkowski. The large space for each mural was a challenge for these artists being that the paintings had to be painted and installed in pieces. Former Library Director Dr. Ervin Gaines wrote about the three murals as “expressing the prospective and retrospective views of Cleveland”. In 1979, Mieczkowski was teaching at the Cleveland Institute of Art as well as commuting to his New York studio. His Brett Hall mural would accompany the existing 1934 WPA mural by William Sommer entitled The City in 1833. He recognized the visual elements of the Sommer painting and decided to abstract the sun image into his own mural entitled “Sommer’s Sun”. 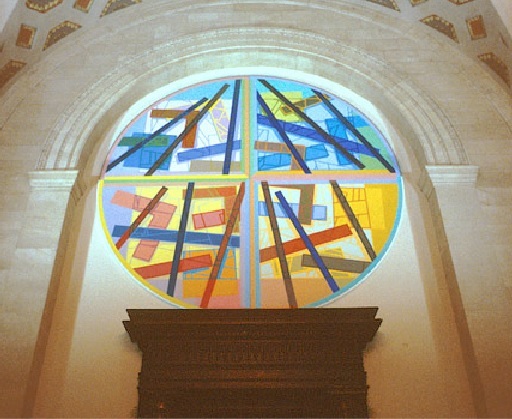 Mieczkowski’s large circular painting (a tondo) represents the sun’s radiance and energy. The Cleveland Public Library wishes to pay homage to Ed Mieczkowski who passed away on June 23, 2017 at the age of 87. As a graduate of the Cleveland Institute of Art (1957) his work became infused with color and abstraction. Read more about his life and artwork in an article by Steven Litt and Mieczkowski’s winning the Cleveland Arts Prize in 1996, in an article by Dennis Dooley .